WHAT is ProTech PRESTO! ? 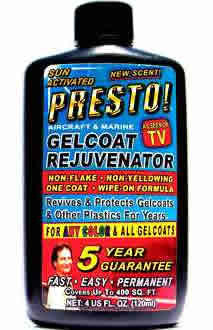 A gelcoat rejuvenator that restores your fiberglass boat to a gorgeous, shiny finish! Say goodbye to that faded, hazy, weather-worn look. Wipe out scuffs and scratches. PRESTO! 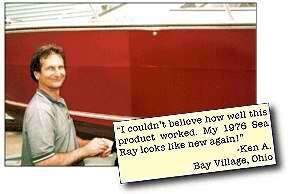 will leave your boat looking brand new! This is the most advanced, highest performing and environmentally friendly product available anywhere. Each product is key-formulated for the surface chemistry the product is intended to be used on. While our products are surprisingly easy to use, they behave UNLIKE ANY PRODUCT YOU MAY HAVE USED BEFORE. This product contain no solvents, no water, no alcohol and no petroleum based ingredients. Easy to follow instructions will help you to get the most value out of this product while easily avoiding the most commonly made application mistakes. Dampen the surface you are working on with water. The way it looks when it’s wet is how this product will make that area look when you are done. If the damage is limited to the clear coat, the scratch or scuff will vanish when it gets wet. The same applies to color damage. Please note: if the pigment is too faded or worn away it will not rejuvenate when it gets wet, therefore, you can tell where PRESTO! won’t be helpful. 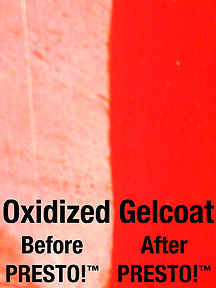 If the color is damaged, then the color must be repaired or replaced before using this product.